Growing up in Newfoundland, long before the ubiquity of flu shots and antibacterial hand gel, my siblings and I went through more than our share of winter sickness. My mother took care of us. Mild colds and regular flus to more serious illnesses like chicken pox or measles—all were indulged in the same manner: a steady regimen of lying on the living room couch, cozy under a blanket, with the TV on and a glass of flat ginger ale and stack of saltines on the coffee table. But before the couch was made up and ginger ale brought from the kitchen, my mother would kiss our foreheads to check for fever. We didn’t own a thermometer; if you were sick enough to have your temperature taken with a thermometer, you were sick enough to visit Outpatients. Besides, that gentle forehead kiss told my mother everything she needed to know. The whole routine, from kiss to crackers, was comforting—so comforting that now that I’m a mother myself, I sometimes find myself wishing for a slight cold or flu, a strange rush of nostalgia brought on by the taste of Canada Dry and the sight of a blanket-covered couch. But my mother doesn’t look after me anymore. She just dispenses advice when my children are sick, despite the fact that I, too, believe in the power of the glass of ginger ale with a bendy straw. “Can’t the doctor give him something to keep him healthy?” my mother asks, worried about both of my kids but particularly about our little boy, who seems to be more vulnerable. “He’s already had his flu shot,” I tell her. She worries about every possible head cold and ear infection, though underneath I suspect a dark fear that something else might go wrong. Maybe it’s the memory of her older sister, Bessie, who died at eighteen months old. My mother never knew her sister, but her father told the story many times: the doctor taking little Bessie away while she waved bye-bye over his shoulder. So Mom always took our childhood illnesses seriously and remembers the tubes in my ears and my brothers’ measles, strep throat and tonsillitis vividly. With her grandchildren, she’s doubled down on maternal concern. 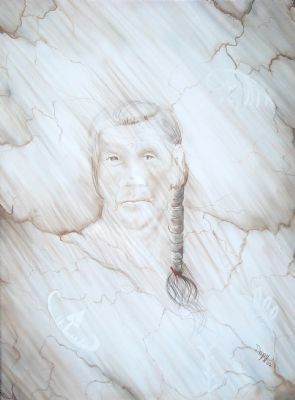 Penobscot by Arlene “Dozay” Christmas. 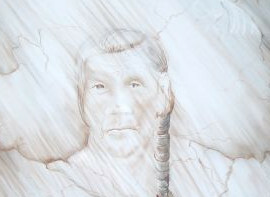 This piece honors Penobscot women who are resilient healers and teachers of their People. I don’t remember this at all. I checked with my brothers and sister and they don’t remember either. Whatever those tonics were, they couldn’t have been all that frequent or vile-tasting; my father still talks about the horrible taste of the cod-liver oil they were forced to swallow every morning at school. Bad tastes stick in the memory as well as in the throat. When was the last time the doctors gave out “tonics”? I did some digging. In Newfoundland, the practice of giving healthful tonics continued into the ’60s and ’70s, bolstered by belief in the benefits of cod liver oil and preparations like Infantol, guaranteed to help your baby grow. The tonics, with a few exceptions, were mainly vitamin water with other ingredients ranging from minerals to caffeine, wine, and yeast. While most were probably harmless, and some may have done some good (particularly in the days when rickets was common), they couldn’t have helped us much, given our regular bouts of illness. Besides, compared to the promise of a flu shot, updated every year for new viruses, a tonic sounds outdated, like arsenic to effect a “healthy paleness.” So instead, I teach the kids to wash their hands before they eat. I encourage them to get fresh air and exercise and stick to their bedtimes. I try to keep them as healthy as their picky appetites allow. For now, I’ll keep my faith in hand washing and flu shots, even though nothing will completely prevent the yearly incursion of colds and flu. Viruses and bacteria will piggyback into the house on any one of us; it really is just a part of life. And when the inevitable happens and the children get sick, it won’t be any modern idea or product that gets them well again. Instead, I’ll do the same things my mother did: the efficient tucking-in of blankets on the couch, the TV, bendy straws and ginger ale, and the comfort of a gentle kiss to check for fever in the middle of the night. As remedies go, these things have been one hundred percent effective. In fact, I think my mother and I have used the best kind of tonic all along. Susan Whistler is an essayist, fiction writer, and columnist living in New Glasgow, Nova Scotia. Taking inspiration from her coastal surroundings and day-to-day family life, she writes both humour and contemporary fiction and is the author and co-creator of the children's book The Great Crow Party. Originally from Newfoundland, Susan stays true to her roots as a cheerful cynic who loves cold winds and hot beverages. She can be found online at susanwhistler.com. Arlene Christmas (Dozay) has spent much of her life cultivating her passion for art. Growing up in western New Brunswick on the Tobique First Nations, Dozay is the middle child of a large family. At eighteen, she left the banks of the Tobique to pursue a formal education at the Nova Scotia College of Art and Design and although she had always displayed an interest in art, her initial intention had been to pursue a career in education. It wasn’t until her third year at NSCAD, with encouragement from several important individuals, that Dozay decided to switch to the fine arts program and pursue a full-time career as an artist. See more of her work online.